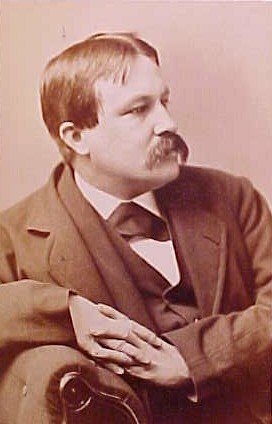 William Dean Howells (1837-1920), author, editor, and critic, was born on 1 March 1837 in Martinsville, now Martins Ferry, Ohio, the second son of eight children born to Mary Dean Howells and William Cooper Howells, a printer and publisher. As the family moved from town to town, including a year-long residence at a utopian commune in Eureka Mills, later described in his New Leaf Mills (1913), Howells worked as a typesetter and a printer's apprentice, educating himself through intensive reading and the study of Spanish, French, Latin, and German. After a term as city editor of the Ohio State Journal in 1858, Howells published poems, stories, and reviews in the Atlantic Monthly and other magazines. A longer work, his campaign biography for Abraham Lincoln, earned him enough money to travel to New England and meet the great literary figures of the day-Nathaniel Hawthorne, Ralph Waldo Emerson, Henry David Thoreau, James Russell Lowell, and Walt Whitman among them. Awarded the post of U. S. Consul to Venice in 1861 for his service to the Lincoln campaign, Howells lived in Italy for nearly four years. During his residence there, he married Elinor Mead Howells in 1862, and by 1872 the couple had three children: Winifred (b. 1863), John Mead (b. 1868), and Mildred (b. 1872). After leaving Venice, Howells became first the assistant editor (1866-71) and then the editor (1871-1881) of the Atlantic Monthly, a post that gave him enormous influence as an arbiter of American taste. Publishing work by authors such as Mark Twain and Henry James, both of whom would become personal friends, Howells became a proponent of American realism, and his defense of Henry James in an article for The Century (1882) provoked what was called the "Realism War," with writers on both sides of the Atlantic ocean debating the merits of realistic and romantic fiction. While writing the "Editor's Study" (1886-1892) and "Editor's Easy Chair" (1899-1909) for Harper's New Monthly Magazine and occasional pieces for The North American Review, Howells championed the work of many writers, including Emily Dickinson, Mary E. Wilkins Freeman, Hamlin Garland, Sarah Orne Jewett, Charles W. Chesnutt, Frank Norris, Paul Laurence Dunbar, Abraham Cahan, and Stephen Crane. He was also responsible for promoting such European authors as Ibsen, Zola, Pérez Galdós, Verga, and Tolstoy. Despite Howells's professional success, his personal life during this period was marred in 1889 by the premature death of his daughter Winifred, whose physical symptoms were misdiagnosed as resulting from a nervous disorder and were ineffectively treated. After the execution of the Haymarket radicals in 1887, which he risked his reputation to protest, Howells became increasingly concerned with social issues, as seen in stories such as "Editha" (1905) and novels concerned with race (An Imperative Duty, 1892), the problems of labor (Annie Kilburn, 1888), and professions for women (The Coast of Bohemia, 1893). Widely acknowledged during the late nineteenth and early twentieth centuries as the "Dean of American Letters," Howells was elected the first president of the American Academy of Arts and Letters in 1908, which instituted its Howells Medal for Fiction in 1915. By the time of his death from pneumonia on 11 May 1920, Howells was still respected for his position in American literature. However, his later novels did not achieve the success of his early realistic work, and later authors such as Sinclair Lewis denounced Howells's fiction and his influence as being too genteel to represent the real America. Although he wrote over a hundred books in various genres, including novels, poems, literary criticism, plays, memoirs, and travel narratives, Howells is best known today for his realistic fiction, including A Modern Instance (1881), on the then-new topic of the social consequences of divorce; The Rise of Silas Lapham (1885), his best-known work and one of the first novels to study the American businessman; and A Hazard of New Fortunes (1890), an exploration of cosmopolitan life in New York City as seen through the eyes of Basil and Isabel March, the protagonists of Their Wedding Journey (1871) and other works. Other important novels include Dr. Breen's Practice, (1880), The Minister's Charge and Indian Summer (1886), April Hopes (1887), The Landlord at Lion's Head (1897), and The Son of Royal Langbrith (1904). Howells remained proud of his Ohio roots throughout his life, returning to Columbus for the Ohio Centennial Celebration in 1888 and visiting his home in Jefferson late into the 1890s. In the later part of his career, he drew increasingly on his life in Ohio in autobiographical works (A Boy's Town,1890) and novels (The Kentons, 1903). The legend of a man from Leatherwood Creek, Ohio, who convinces the people there that he is a god inspired one of Howells's last works, The Leatherwood God (1916). ©2001, The William Dean Howells Society; image scanned by site owner and uploaded in 2001.